Back in the late 1970s, a Birmingham rock band called City Boy finally hit the big time after three years of hard graft. Their single 5-7-0-5 climbed the UK chart to number eight and despite a couple of lower charting follow-ups, What A Night (no.39) and The Day The Earth Caught fire (no.67) they’ve been labelled as one-hit-wonders by which time the band had really had enough. They formed a band called the Maisonettes – which was a play on Lol’s surname – and comprised Lol (vocals), Mark (keyboards and guitar), Elaine Williams (vocals), Denise Ward (vocals) and Nick Parry (drums). It turned out that Elaine and Denise could not harmonise sufficiently so two other singers were drafted in, but by the time their first single had been recorded all the publicity material had already been published. That first single was Heartache Avenue which was recorded as a demo but it was agreed that it sounded good enough to be the finished article, so they sent it round to a number of record companies who all turned it down. Mark explained how they eventually got a record deal, “Our drummer, Nick, said he knew David Virr who ran UB40’s Graduate label so we gave him a cassette and within a week he told us he was interested in publishing it.” It was eventually released on a Graduate subsidiary label called Ready Steady Go! The song was, as Lol and Mark wanted, Northern Soul influenced with a touch of Motown which was more well-known and thus caught the public’s attention and climbed the chart to number seven. 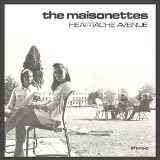 They released two follow up songs; Where I Stand and Say It Again but they sank without trace, they even released a 10-track album called Maisonettes for Sale which only charted in Canada. With no further chart action, they broke up. Heartache Avenue got a new lease of life in 2011 when the grime outfit, Roll Deep sampled it in their UK number 11 hit The Avenue.